The female-fronted goth/symphonic metal band has become less of an obscurity, or novelty for that matter, in the collective consciousness of the metal community these past several years. That has especially been the case in North America where a number of acts have done quite well from a sales/profile standpoint. Whatever the case, SIRENIA has been a known quantity on the international scene for several albums now and its leader, composer, and multi-instrumentalist Morten Veland has guided the band through a multitude of lineup changes and continued to release quality albums that offer something more than the cookie-cookie approach taken by some acts in recent years. "The Enigma Of Life" does nothing to tarnish that reputation. "The Enigma of Life" will not convert those that were never interested in the style to begin with, but it does have a chance with the fence sitters, thanks to the relative degree of diversity in the songwriting. 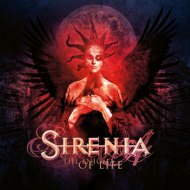 Spanish siren Ailyn makes her second appearance on a SIRENIA album and her performances shines bright on every track. Granted, a handful of those tunes do sound rather typical for the subgenre, but even in those cases Veland's knack for penning hooks makes a sizeable impact. "The End Of It All" is the catchy case in point, its chorus impossible to dislodge from memory. It is on those tracks where Morten has injected more of a dynamic approach to composition that keeps "The Enigma Of Life" from turning into one of those albums that begins to lose identity after the halfway point. The combination of both male and female lead vocals on "A Seaside Serenade" and "Darkened Days To Come" is a winning one, the latter maybe even better "The End Of It All" for most infectious melody line. The choral parts on both tracks, as well as on "Winter Land" serve a purpose beyond atmospheric enhancement and become integral to the arrangements. One would be hard pressed to call "The Enigma Of Life" a watershed release. It is, however, a very well-written album with more than its fair share of enchanting melodies to go with Morten's knack for translating the emotional peaks and valleys of the lyrics to the language of music.